Let me just put this out there: I am OBSESSED with quinoa. Seriously. I can search hours on end for ideas as to what I can do with this stuff! I love that it's so healthy, and that a small amount will cook and double in size! Basically I've been eating it nonstop lately.. So I made this cold salad last week, and it's perfect to eat on hot summer days. It's healthy, and so easy to whip up. Enjoy! 1. Cook quinoa according to directions on packaging. 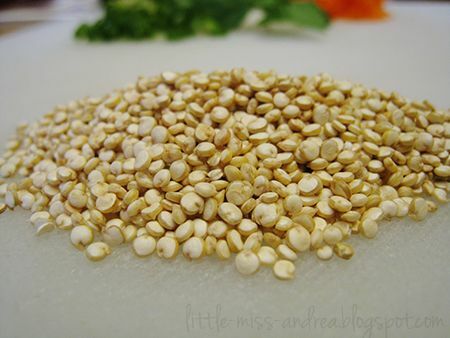 Typically 1 cup quinoa to 2 cups water, simmer 15 minutes until water is fully absorbed. Set aside and allow to cool. 2. 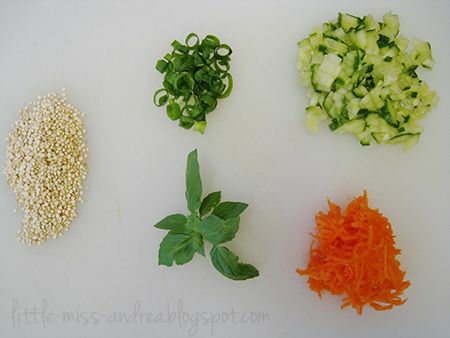 For the dressing, combine lime juice, fish sauce, oil, sugar, basil & Sriracha in a bowl. 3. Set aside 2 or 3 shrimp for garnish. Take the remaining shrimp and chop into bite sized pieces, then place in the dressing and allow to marinate for 5-10 minutes. 4. 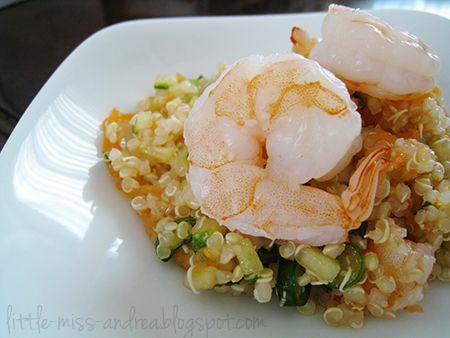 Once the quinoa is cool, add the cucumber, green onion and carrots, then mix everything with the shrimp and dressing. Adjust the taste if necessary. Garnish with reserved shrimp and the salad is ready to serve, but I prefer to pop it into the fridge for about an hour to cool it down. Enjoy! I love your blog dear.. maybe we can follow each other? Question: is the fish sauce prepared, or straight out of the jar? looks delicious! you are a great chef, i didn't know! 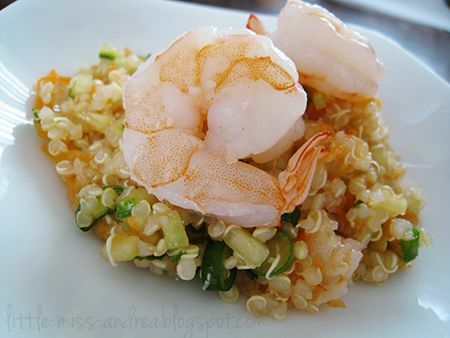 i am not very into quinoa but love shrimps and the salad looks fantastic! Haha, I wouldn't exactly go as far as to call myself a chef since I hardly cook at all... :P Thx Lena! I love that bags of quinoa last FOREVER. It feels like you get such a good deal hahah. Let me know when you try this out, Kay! looks great! I love quinoa too- I love doing it with sweet things actually! like pineapple and coconut? so good. I need to try quinoa soon. Is quinoa like oatmeal? Is quinoa filling? It's getting popular now. Will definitely try your recipe. 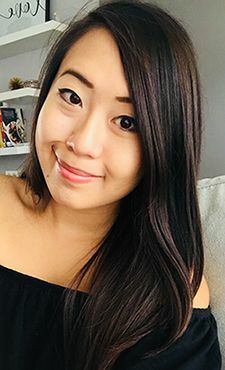 It looks simple and fast to prepare and I love Vietnamese salad dressing :) Thanks for the wonderful recipe and your blog is great. Keep up the good work! Quinoa is somewhat like oatmeal.. minus the stickiness and starchiness. It's not exactly very filling for me by itself, as it is a source of protein rather than carbohydrates, which is why I tend to mix it up with other things to make the dish itself filling in the end. Thanks for the kind words! Let me know how your quinoa adventure turns out! Mmm this looks really delicious and healthy! Thanks for posting up the recipe! I love quinoa too! I usually make it a Greek style quinoa salad. This is a nice variation. I'm gonna try it. You are making me hungry. That looks delicious. This looks so divinely yummy! I am not familiar with quinoa at all but it sure looks delicious. And the way you put together this recipe post is so neat and tidy and filled with effort! Well done! omg Andrea, this seriously looks yum and ohhh so healthy! I think i gotta try this!